First off, it was a mistake to figure that the weather would be as nice in Boise, ID as it has been here in the Tri-Cities. That being stated, I did not pack warm enough clothes. Jesse and I left for Boise Wednesday night, and had a fun weekend showing off both of the dogs. Thursday 10-09-08 Hunter had his best (IMO) showing yet. He was alert, moved out well, free stacked like a pro, was beautiful on the table etc. I guess the judge wasnt as impressed. Hunter left without a point this day. Bummer. Saturday 10-11-08 There are metal grates in the concrete flooring of the building we were in. It was obvious that the show people tried to cover them up so people wouldnt trip on them. We were unfortunate enough to get a covered grate at the very end of the down and back that made scary noises. Hunter just knew that something was going to eat him in the floor… despite being a little squirrly Judge Lester Mapes awarded him Winners Dog, Best of Winners and Best Opposite. Ten points down! 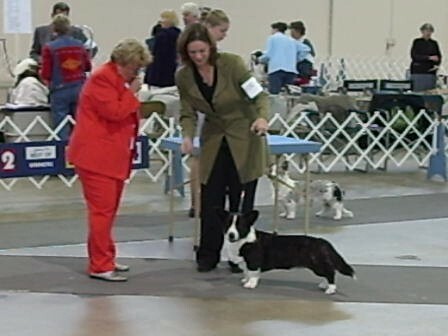 Sunday 10-12-08 Hunter recovers well from thinking the floor is out to get him, and Judge Arlene Benko awards him Winners Dog, Best of Winners for another point, and Best Puppy which enters him into Puppy Group. She tells me that I HAVE to stay for puppy group – since I have such a nice puppy. It was a super nice compliment and so Jesse and I stayed for puppy group. It was the last group of the day, so a lot of dogs had already gone home or there werent puppies entered in some breeds. Hunter was a hoot and he really turned on the struts for all the applause. We got a Puppy Group 3 out of about 7 other dogs. That was neat! 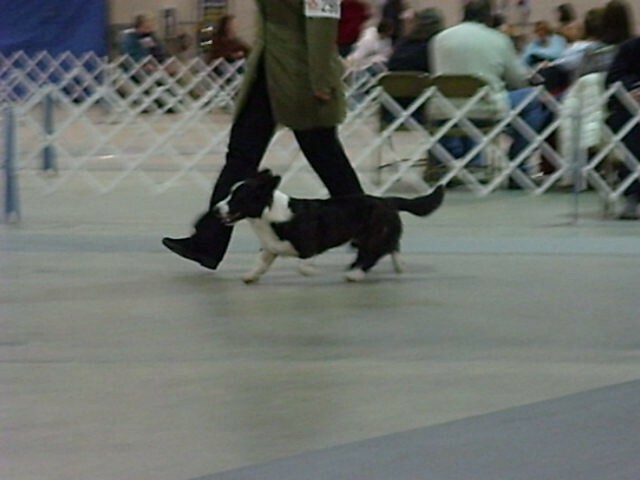 I think the biggest compliment of the weekend was from the herding puppy group judge (whom wasnt listed in the catalog but I will find her name later) who said that she always kinda liked the breed, but this dog (Hunter) was a dog she could fall in love with. Be still my heart! Jesse and I know how much fun and just plain delightful Hunter is to be around. It is really awesome when he and Ellyn inspire happiness in people that are just walking by. It feels just as good that so many different judges have liked Hunter. What a great way to spend a birthday weekend. Hunter now has 11 points and one major.